DISCLAIMER AND WARNING: During the reporting of this article, I was coerced with fine beer and good conversation by Will and Dan Shelton to adopt a certain editorial slant favorable to their products. They intimidated me with tales of their harrowing adventures across a wide expanse of the international beer scene and made me question my very identity as a guy who knew his way to the bottom of a pint of fine brew. These men speak beer heresy, and their arguments can beguile the weakminded. Your favorite ale might not taste quite the same after reading. On Friday, October 29, the head brewer and owner of Sam Adams Brewery, Jim Koch, spoke at a press conference at La Veracruzana, a Mexican restaurant in Northampton. He was in town to bring media attention to a fund he’s created to assist small food and beverage entrepreneurs to achieve their business objectives. Introducing Koch, U.S. Rep. Richie Neal pointed out that the brewer ran the biggest American beer company. “His company has 1.9 percent of the market,” Neal bragged, but Koch had to interject. “It’s .9 percent of the market. I wish it was 1.9!” the Sam Adams head brewer said. After coffee and tea, beer is the most-consumed beverage on Earth, so even almost 1 percent of the U.S. market is a lot. Koch has made a healthy living and gained international recognition for his business. When it was founded in 1984, though, he was one of the first of a new breed of microbrewers on the scene (Koch started brewing in his kitchen at home), and giant American brewers like Budweiser and Miller duked it out for the title of biggest. The only hope for a small brand like Koch’s to make a dent in the monster competition was to offer something unique and aggressively market it. The company emphasized that its beers were hand-crafted, and with Sam Adams as its mascot, touted its patriotism. In the decades that followed, Koch’s approach proved successful, and the giant brewers slowly got gobbled up by even bigger beasts. Beers that were once quintessentially American were acquired by foreigners. InBev, a joint Belgian and Brazilian company, now owns Budweiser and Michelob, and Miller and Coors now belong to SABMiller, which has its headquarters in England. As America’s mainstay beers became corporate and global, something that many thought nearly extinct in America started appearing everywhere: fresh, delicious local beer. Other kitchen-sink brewers, following Koch’s model, started stepping up production and offering a bewildering array of finely crafted beers for sale. Throughout the 1990s a sort of microbrew renaissance was under way. And beer drinkers responded. Instead of aligning themselves with one brand early on, as their forefathers did (i.e., “I’m a Bud man”), many beer drinkers got adventurous and charted out and claimed their own territory. They began rating what they drank, developing favorites, and lo! a nation of beer snobs was unleashed upon the market place. Take the Sam Adams press conference, for instance: after flubbing Sam Adams Brewing’s share of the market place, Rep. Neal got big laughs when he joked that while he might not know a whole lot about the beer industry, he was, nonetheless, a beer expert. These days, throw a rock in a crowded bar (or the House of Representatives, apparently) and you’re likely to hit several self-proclaimed beer “experts.” We are legion. And as we slake our thirst for new flavors, exotic variety has become the highest mark of distinction for a brewery. As we entered the new millennium, what had started out as return-to-roots brewing (small batches made from local ingredients) became something of a circus. Instead of brewers refining their beers, they made their flavors more intense, and they began packaging the results in sampler packs reminiscent of a roll of Lifesavers. Each month, there seemed to be reports of new achievements in boosting alcohol and hops to once unimaginable heights. For a while, Sam Adams brewery led this charge with beers that came in at more than 25 percent alcohol, but this past year, the Scottish microbrewery Brewdog released a beer for the American market they call Tactical Nuclear Penguin that was 32 percent. Nathan Hobbs’ response was decisive. Looking for story ideas, I’d asked the general manager of the Dirty Truth in Northampton, a bar with 40 taps, if there were any local brewers he had on tap that he could recommend I talk to. His eyes lit up when I said I wasn’t familiar with Shelton’s High & Mighty line of beers. Will is one—along with Dan and Joel—of the three brothers who comprise the Shelton Brothers beer importing company, based in Belchertown. Since the mid-’90s, the company has imported beers from across the globe to drinkers across the United States. In 2006, Will took a hiatus from the import business to begin brewing a beer he’d been dreaming of. Working in Paper City Brewing’s facility in Holyoke, he’s created a line of distinctive beers that manage to buck the national trend toward gimmickry and record-setting while remaining faithful to traditional brewing styles. High & Mighty’s beers are the result of a lifetime of study. In earlier careers that had the Shelton brothers traveling across the Atlantic regularly, each sought to outdo the others by returning home either with a rarer, more scrumptious bottle of beer, or a tale of brewing bliss found in some back alley of a Belgian city or at the kitchen table of a German farmer. They sought out brewers by word of mouth and went to towns and taverns that weren’t on other beer drinkers’ maps. Along with developing a highly informed palate for the world’s best beers, they made a lot of friends and future business partners. Though started almost on a whim, their business now imports from a wide range of brewers hailing from nations as far afield as New Zealand. Will Shelton now manages both careers; by day he’s in the Belchertown offices, and on weekends and evenings, he’s often down at the Holyoke brewery. Perched in the front window of the Dirty Truth in Northampton, overlooking Main Street, I interviewed him last spring about his work over two big mugs of High & Mighty’s Beer of the Gods. When I took a swig, a burst of cold suds frothed up around my tongue, rich with bitter wheat malts and sharp citrus jabs of hops. At 4.5 percent alcohol, rather than the tang of the booze, I tasted beer. This, he explained, was deliberate. In addition to offering a balanced and delicious flavor, Will Shelton’s ideal beer also makes a political and culinary statement. I should disclose that before sitting down with Will Shelton, I’d had another beer story well underway. I had been deep into research for a report on Imperial Indian Pale Ales. In the swelling ranks of beer snobs, many of us who enjoy Indian Pale Ales (IPA) identify ourselves as “hops heads,” and we seek out beers with crazy amounts of the ingredient. “Hop Stupid” is a term of adoration for the most intensely hopped beers. Originally, British brewers added hops to their pale ales to help preserve something of the original beer flavor by the time the casks arrived in India for the troops. Like salted beef or freeze-dried ice cream, IPAs were once thought of as not an ideal way to enjoy your beer, but fine in desperate circumstances. These days, though, most new American brewers make certain to include at least one IPA in their lineups, and, looking to distinguish themselves, many American brewers have indulged beer daredevils by turning up the hops volume all the way to 11—and beyond. IPAs that have twice the hops and alcohol are endowed with the distinction of being “Imperial.” Stouts also receive this mark of honor, should their stouty-ness be ratcheted up. Will Shelton is a brewer who will not play the hops heads’ games. He doesn’t brew an IPA. He has a fine appreciation for the ingredient, but argues that beers made with intensified levels of any ingredient taste less good, are less complex and ultimately damage the beer-drinking experience overall. “It could be argued [Imperial beers] have more flavor because they have more things in them,” he told me, “but all the complexity is masked by the alcohol. They’re usually over-hopped to compensate for the sweetness of all that malt they need to create that alcohol. “It takes a more perceptive, sophisticated palate to enjoy lower-alcohol beer,” he said. “But once you’re there, it’s hard to go back and drink those other things. “And,” he said, “almost everyone gets there. Going through your career of drinking, discovering things you like, everyone goes through stages. I’ve never met anyone who didn’t. Everyone starts in the same place with light lager. And then maybe you move into hoppier American beers, and then something imported. Belgian beers, maybe, stouts, Imperial stouts, barleywine. But eventually, everyone comes back to German lager and English bitter, because those are the beers you can enjoy a few at a time and they will have less of an impact on your daily life later. “Kind of jokingly, I’ve been saying that I think high-alcohol beers are ruining the world. They’re making it more difficult to maintain the kind of pub culture I really enjoy. I love going to England. It’s one of my favorite places in the world, because of their pubs and their people. “More and more, and especially here in this country, people are drinking these high-alcohol beers like they’re drinking regular beer. But it’s not 4 or 5 percent, it’s 9 or 10, and after a couple, they’re either done or they’re dangerous. And they’re usually not worth having a conversation with. High-alcohol beers are driving people to drink at home, where they’re really safest doing so. The beers that inspired Will and his brothers to first import and then brew beer come largely from Belgium and Germany. Will still travels there regularly and has colleagues throughout Europe; the brothers import their beer from some, and with others Will trades brewing secrets. “All these small towns in Germany are essentially making the same beer, but every one is different,” Shelton said. “They all taste different from batch to batch and town to town based on what ingredients they have access to. “You can make calculations to adjust for changing flavors, but unless you’re really dialed in, like a big brewer, and you’re buying ingredients in huge quantities and blending multiple batches together, there’s going to be variation between brews for any small brewer. Which is what I love about it,” he said. The beer that caused the greatest mental detonation for the brothers—Cantillon—they discovered in downtown Brussels. It was the beer that drove them to become importers, and when Shelton asked me if I’d like to try some, I eagerly agreed. At a minimum of $17 a bottle, Cantillon makes everything on tap seem almost affordable. He explained that once the ingredients had been boiled together, the brewers pumped the batch of new beer to the top floor of their building and spread it out in a wide, flat pan only a few inches deep, and for one night they opened the windows and essentially let whatever was blowing in the wind ferment the beer. The next morning they pumped it down into casks, where it fermented for three years. Different casks, each exhibiting slightly different qualities, are blended with younger fruit beers to make the final beer that’s known as a Gueuze, a type of lambic. The most popular lambic in America these days is something produced by another Belgian brewer, Lindemans. Instead of pursuing traditional small-batch brewing methods, Lindmans produces 8 million liters of lambic every year, designed to appeal to the American palate: super-sweet. Instead of fruit being included in the brewing process, flavors are added afterwards, sometimes artificially. It’s everything that Cantillon is not. Pouring me a glass of the cloudy, gently fizzing stuff, Shelton explained a misapprehension from which he felt many American beer drinkers suffered. “When you’re talking about something having complex flavors, it’s not about trying to identify all the different ingredients a drink has in it,” he said. “It’s about recognizing new flavors that have been created by combining them, taking them through the brewing process and seeing how they ferment.” He pointed out that wine drinkers don’t stand around saying how much grape a particular wine has in it, and when they say a wine is “smoky with earthy wood tones,” no one supposes the winemaker smoked his wine and put lumber into it. They’re describing the results of the fermentation process on a particular grape from a particular place and time. For American beer drinkers, though, if the bottle says it’s got cherries or apricots inside, it had best taste like that fruit, and if they return to the drink later, the flavor had better be identical or it will swiftly be declared crap. Cantillon tasted like no beer (American or otherwise) I’d ever tried before. As I’d been warned, it’s sour, but not like sour candy or biting into a lemon. More like the yeasty tang of a loaf of sourdough bread or a juicy, ripe apple. In fact, it reminded me of a hard cider I’d had once, long ago in England, and I said as much. We happily finished the bottle, each trying to describe the elusive flavors. Much of the Shelton Brothers’ work as beer importers can be done with a telephone and an email account, negotiating terms and delivery with their brewers and distributors, and navigating the legal side with state agencies. The Sheltons now import more than 170 beers from more than 50 brewers from across the globe, and they sell their wares in more than 40 states. Each kind of beer needs to be annually registered in each state—a job that requires the full-time focus of one of their employees. Along with managing finances and bureaucratic hassles, the life of a beer importer dealing with so many small brewers unaccustomed to working on the international stage entails an unending series of minor calamities. It took a while for Will and me to schedule a followup interview because several of those occurred in short order. Just before I met the brothers in their Belchertown offices, for instance, a holiday shipment that had arrived in their New Jersey warehouse was discovered to have defective bottles; beer had begun to burst, leaving a sticky mess to clean up. Dan Shelton appears to take these types of trials mostly in stride. It’s the resistance of particularly combative and devout American beer “experts” for whom he reserves his most colorful language—which, like the beers he sells, is complex, tart and has a hint of bitterness to it. Sitting at a table in what used to be the Shelton family dining room, Dan Shelton wanted to make certain I understood where he was coming from. If that were true, he pointed out, why would anyone bother to review anything? If there wasn’t consensus in the wine world, say, how could a wine dealer get away with selling a $100 bottle of wine? “If everything’s great, then nothing’s great,” he said. While business has been improving for the Shelton brothers recently, during the first 10 years, they operated at a loss. Their business model, such as it was, was to travel through Europe searching for small beer makers who were brewing small batches of the kinds of beers that couldn’t be found elsewhere, and then negotiate with them for the right to sell the beer in the States. To illustrate his devotion, he told me the story of how they first got into the beer import business. His brother Joel, a musician, had visited the Cantillon brewery while performing in Brussels, and he had returned with some bottles for his brothers to sample. When Dan was unable to find the beer for sale anywhere in New York, where he was living at the time, a shop owner suggested he get his importer’s license and try to import it himself. Initially, the plan had been to work with an established importer, but when the first two he approached seemed uninterested, he considered going it alone. While considering, he read in a beer journal that Cantillon had agreed to be imported by the first importer Dan had approached. Scared of losing the battle before he’d even begun, he raised the quantity he was ordering. Originally, he’d thought of getting four pallets of the beer, sharing most of it with his brothers, and selling off the rest. Suddenly, though, he was more than $20,000 poorer, and the proud owner of 19 pallets of beer. He remembered taking a bottle home and celebrating—he opened it on the roof of his Brooklyn apartment with his girlfriend. One sour gulp and she looked at him with a constricted face and asked him to repeat exactly how much of the beer he had bought. He learned the import business the hard way. He lost count of how many times he had to convince resellers and distributors that the beer hadn’t gone bad and that it was supposed to taste that way, but after a year, he was proud to say that he and his brothers handled almost 2.5 percent of all beer imported from Belgium (since then, their share of the Belgian import market has gone down to a fraction of a percent), and he was ready to place a second order. Along one of Holyoke’s canals, high up on the fifth floor of an old brick factory building, resides the Paper City Brewery. The Sheltons had worked with the brewery in the past on distribution issues, and when Will decided he was ready to brew, he approached his friends there about the possibility of using their equipment. They obliged, and he’s been brewing there since 2006. He and Dan share a dream of one day opening their own brewery, but for the time being, Will spends a lot of nights and weekends in Holyoke. After visiting the import offices, I followed Will down to Holyoke, where he had to put labels on a new beer that had just been bottled. In the months since we first spoke, he had added two beers to his lineup. One was a custom pilsner for a Boston cafe (Will’s beer beat out several brewers for the contract), and another was something he called XPA, which was what he was bottling that night. I asked him if he’d succumbed to pressure from the hop heads, but he denied that his beer was an IPA. To be sure, it had a nice, refreshing blast of hops, but it was milder than an IPA and had that balanced blend that the Sheltons like so much. After a couple hours of labeling beer, Will said he had one last experience he wanted to share with me. Up the road at the Moan and Dove, the barkeep was going to tap a cask of beer the brothers had had imported from one of their favorite small-town German breweries. The cask wasn’t very big, and due to the demand, there was a limit of one mug per patron. Each glass cost nine bucks. If we hurried, Will said, we could probably have our share. As luck would have it, we reached the bar just in time. The placed was packed, full of the kind of convivial pub atmosphere Will seeks to protect. As I settled onto a stool, he brought the last two mugs to our table. A couple of other employees from Shelton Brothers Importing sat with us, and Will clearly knew most of the others at the bar. While I quaffed, he chatted up the crowd. Unable to hear above the din, I focused on my drink. Perhaps it was the ample buildup I’d had earlier that day, but as the golden lager went down, I had an appreciation for the distant small-town magic that had created it. It was utterly delicious. An ideal beer. 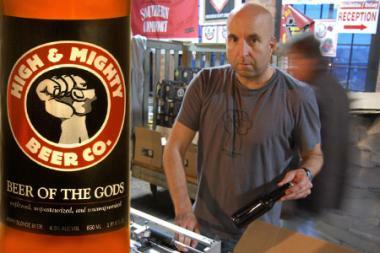 On the home page of his High and Mighty website, Will declares he’s not just interested in brewing, but beer evangelism. But more than any Jehovah’s Witness with a Bible in hand standing in my doorway, Will and Dan Shelton, with their sermonizing, struck a nerve. I haven’t given up any of my favorite beers, but I’ve thought a lot more about the next step I’m going to take. As emphatic (okay, arrogant) as they could be about the state of American brewing, the Sheltons’ convictions were grounded in a joy for and deep knowledge of fine beer. Faith wasn’t required in adopting their views. They had all the evidence they needed. I only had to drink it.